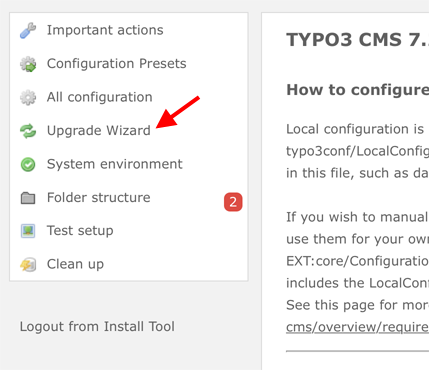 If you upgrade your TYPO3 CMS installation from one major version to another (for example 6.2 to 7.6), it is advised to run the Upgrade Wizards. They guide you through the necessary steps to upgrade your database records or explicitly install extensions that ship with the latest TYPO3 CMS version. Coming from an older version it might be that the basic content elements, provided by the core of TYPO3 CMS were rendered by the extension "CSS Styled Content (css_styled_content)". Some changes have been made since moving the rendering to the extension "fluid_styled_content". Some database fields of the table tt_content are no longer used, the fields of FlexForms have been moved to proper database fields and the content elements "Text" and "Text & Images" have been merged into a new content element "textmedia". To make sure you do not lose any information or the content elements look differently on your upgraded website run these Upgrade Wizards. The upgrade wizards can be found in the Install tool. The predefined CONTENT objects styles.content.getLeft, styles.content.getRight and styles.content.getBorder are not provided anymore. styles.content.get still exists for your convenience. Most of the current websites are using "backend layouts", where the predefined numbering of the columns does not make sense.